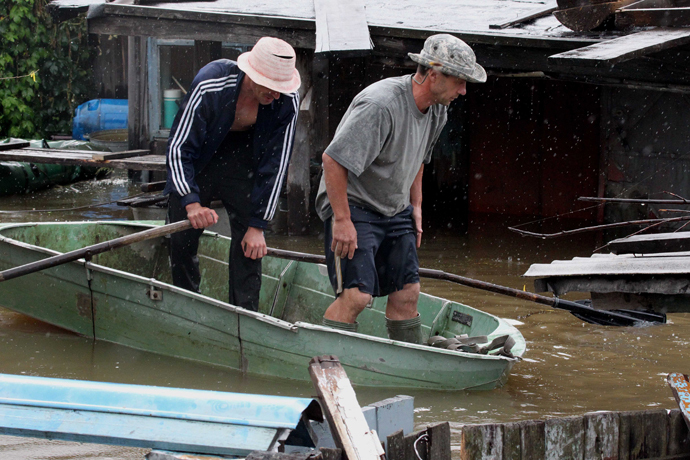 Up to 100,000 people may be evacuated from flood-hit regions in Russia’s Far East. Water levels at local reservoirs have already reached historic highs, and officials say the floods raging in the area are expected to continue rising even further. Floods are currently affecting over 32,500 locals living in over 5,000 homes. Over 17,000 residents have already left the area over the disaster. Viktor Ishayev, Russia’s Minister for the Far East, said that “in the worst-case scenario up to 100,000 people could be evacuated” from the Amur, Khabarovsk and Jewish Autonomous Regions. Dozens of bridges have been swamped by the waters, complicating the evacuation. The area adjacent to the Amur River is experiencing its highest water level ever. However, observers indicated that the situation remains relatively calm. Authorities are dealing with the consequences of the disaster, with over 200 tons of relief cargoes being delivered by aircraft to the affected region. 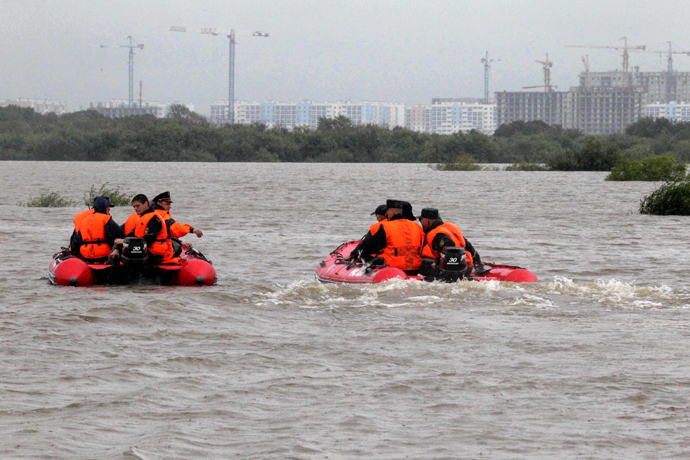 30,000 people are mobilized to cope with the flood with the help of 5,000 vehicles, boats and aircraft. Emergency workers are flying over the affected area, monitoring the water level around the clock. They are asking people to leave their homes, but for those who didn’t have time to quit the region, boat evacuation is planned. Modern anti-flood technologies are also being used. Thirty water-filled flood control dams have been delivered to the region, along with humanitarian aid. Each dam is 25 meters long and can be easily erected on any type of surface, replacing over 1,000 sand bags. Medics have begun vaccinating to prevent an epidemic of infections such as typhoid fever and hepatitis, while locals have started drinking only boiled water as a precaution. “The damage is extensive, but the most significant achievement is there have been no casualties … we cannot relax, there is still a lot of work to be done,” Russian President Vladimir Putin said in a televised address. The disaster has yet to reach its predicted peak on August 19, meteorologists and emergency workers warned. The floods have been triggered by a month of heavy rain, and aren’t set to stop until the beginning of September, the head of Russia’s hydrometeorology monitoring service told RIA Novosti news agency. “This zone is unique in terms of its vastness: over 2,000 kilometers from west to east,” indicated the head of the National Center for Crisis Situations Management of Russia’s Emergency Ministry Vladimir Stepanov. The disaster has dealt a blow to the area’s budget as well, with the potential losses measuring up to 2 billion rubles ($60 million), President Putin’s envoy to the region said. Conspiracy Documentary New World Order Earth in the crosshairs?